With the help of a coworker, I salvaged an 10 year old 200k BTU input Hydrotherm VGA-200. The home was damaged in a fire 7 months ago and insurance has finally settled so it can be demolished. 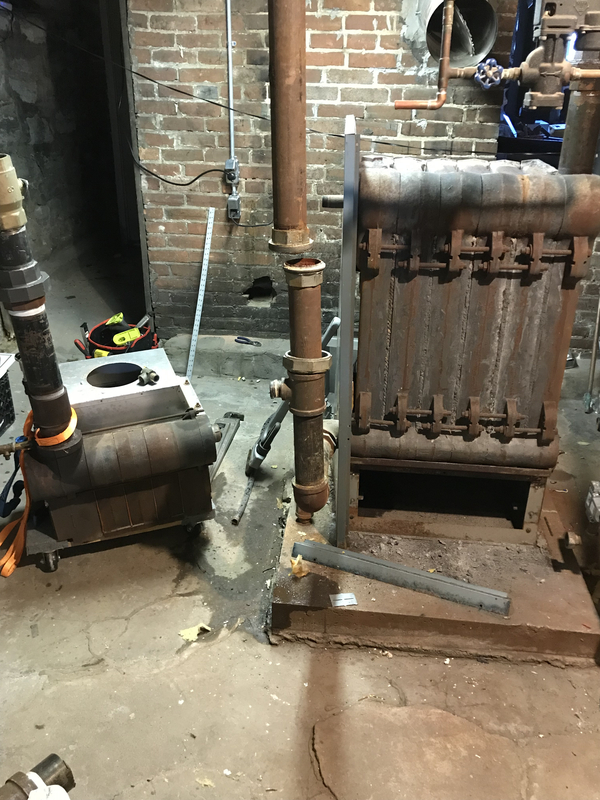 One less 1 pipe steam system in the area. Probably only 3 or 4 left I’d guess. The boiler were drained so they didn’t freeze. The “scrappers” had already cut it loose and it was laying on it’s side. But case and base is still in good shape other than some rust. Flue damper was in automatic, so I’m hopeful it still works. Flue got crushed, but it’s just 7” galvanized pipe. Collector is OK. Cycleguard is destroyed, but those seem to be universally disliked. Some refractory came off, but I salvaged some from a 2nd 300k boiler. The house had a 2 boiler setup. My company installed them. I als salvaged all the burner tubes from the 2nd boiler and it’s cycle guard LWCO. Plan is to plug it and fill it for a basic leak check. Will pressurize it if I can get the 3” pipe out of the supply. Have a 3’ pipe wrench. Then get it in the basement and start the project. Will need to transfer all my intermittent pilot controls, 2 stage gas valve, LWCO and it needs a gauge glass and repair the refractor. The boiler has a single 3” pipe out. I’ll run that vertically about 3-1/2’ then down to a drop header where I’ll connect the existing 3” header then connect the equalizer. I’ll have the brush the flue as they have a light surface coating of rust from the damp basement. And clean up the burners and pick the 5 best looking ones of the 12 I have. Last, I’ll get it setup to eventually add a hot water loop for a indirect tank. Dry return will get two 2”x3/4” fittings for maximum venting. Also found a very clean Detroit Radiator valve and couple wood knobs to replace some of mine. Grabbed a transformer and a contractor too. I use 235 BTU/sqft since pressure is <1oz. Might connect low fire to the upstairs thermostat. Also, its a 1 pipe Vapor system, so I can balance it without filling radiator completely. Tested it with dowfiring my current boiler. Had it down to about a 160k output and system remained balanced. Home heat loss I estimate at 90-100k on the coldest windiest days based on gas bill and duty cycle. Also possible to downfire this to 175k input by changing orifices and low fire would match match design heat loss. Good deal sounds like it will dial in. I got the easy part done. Old boiler stripped and return union loose. But the main will need a torch for sure. Want to recover most of the fittings and will dismantle up to the current highest point of possible so it’s all parallel flow instead of the 2 short counterflow sections right now that look like a failed attempt at a drop header without an equalizer. Decided on using a 1-1/2” black equalizer but will use 1-1/4” copper return piping up to the Gifford loop. Pretty striking the size diff of a 375k 1984 HB Smith vs a little 200K Hydrotherm. The base is in the other room. Need to fix the refractory liner and clean up the base pan. Burner tubes need a little cleaning and heat exchanger needs brushed from sitting for 6 months in a damp basement. Old 900lb boiler block will likely get abandoned in the basement until I get around to breaking the sections apart. Ya.